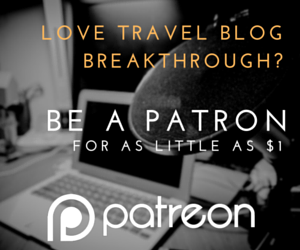 Free travel is the big aspiration for most of you travel bloggers. Even if you don’t admit it, the thought of jetsetting around the world, representing brands, properties, tours, cities or even provinces for free is pretty darn awesome. Imagine that – getting paid to travel. Now that’s the dream right? Getting there is a whole other story. Earlier on in my blogging career, I think a lot of what was holding me back was fear. There was fear of rejection. There was fear of not being good enough. There was fear of not knowing what to do. I was producing good content but hearing about how folks in PR wanted big numbers and big influence turned me away. Another thing that held me at bay from pitching was that I didn’t really know how it worked. For some reason in my head it seemed to involve something elaborate like courting a prince or princess to marry you. What am I supposed to write? How long does it need to be? How professional does it need to look? Oh the questions! With my own personal story of success and samples below, I hope to put your fear to bed. For me, my first successful pitch really started with a DM on Twitter. No joke. Pitching via e-mail seemed like such a big deal that I thought I’d start easy. Just like how you’d say “Hey, what’s up” on a messaging app, I basically did the same thing to a hotel brand I recently started following. The exact words of it were “Hi, just curious, do you guys work with bloggers?” In retrospect that was pretty blunt but I figured there was nothing to lose. And hey, getting rejected for 160 characters is a lot less painful too right? To my surprise, the lady managing the hotel brand’s Twitter account said that they do and after a few more messages back and forth, she passed along an e-mail address to me. That e-mail address then led to further conversations which eventually led to a comped trip in exchange for a review and some social media content creation. It totally wasn’t planned and I myself was surprised at how everything turned out. So the lesson really is: just pitch. My philosophy is that if you don’t go out and create opportunities for yourself, there sure as hell won’t come knocking on your door. I soon realized that the worst that can happen to you is that someone will say “No not interested”. If that happens, just move on. Eventually your message will resonate with someone and you’ll get your first “Yes”. 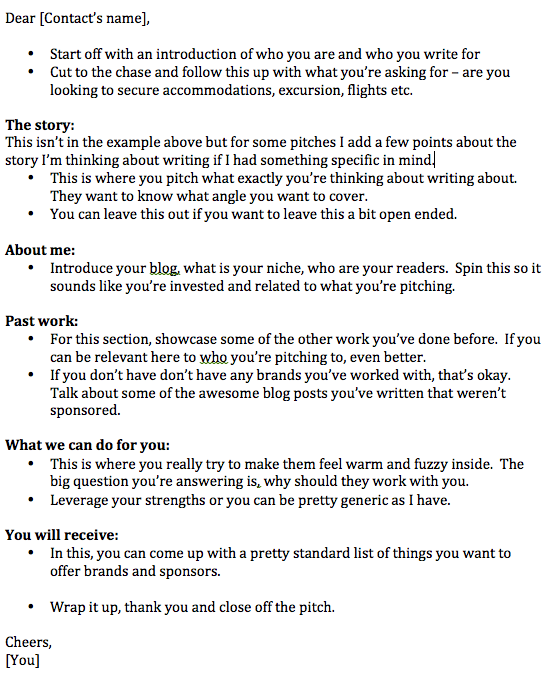 Here’s a sample e-mail pitch that I tweaked with the help of Mapping Megan so a huge shoutout has to go to her. Now don’t go copying what I have as it’ll look a bit fishy when people start getting the same looking emails. My recommendations is to use it as a template to extract out the basic structure of it and fill it out with your own flavor and character. That’s why I’m including a skeleton pitch below for you to use which breaks down what you talk about. A lot of people like myself hesitate because we all know that PR, sponsors and brands care about stats and numbers. So what is considered to be “good enough”? This a topic that’s hotly debated by bloggers these days and there’s one camp which says that you should wait to build your influence and credentials before pitching and there’s another camp that says to just do it even if you don’t have the numbers to back you. I’m of the opinion of just going for it when you feel ready (especially after reading this post right *nudge nudge*). The mindset shift you have to make is that, a lot of times as bloggers, we know a lot more than these brands that we approach. These guys are hungry for new content and fresh audiences. As long as you come off as professional, knowledgable and able to offer those two things that every marketer is dying for, then you have a good chance of picking up a gig. To add to that, there will be companies that you reach out to that have only worked with a few bloggers in the past and so they’re also trying to figure out how it works. These guys are less worried about stats and care more about the coverage and buzz that they could only dream about through paid advertising. Again, bring value, professionalism and integrity to the table and 9 times out of 10, they’ll be willing to take a chance on you. Start easy. I’ve found hotels to be a lot easier to work with than say tourism boards or big brands. Or better yet, what about a local activity like tree top trekking place if that is your thing. Get your media kit in order. They’re going to want to know some numbers and a media kit is a great exercise to get it all in one place. Just remember it doesn’t matter how big or small you are. Even David conquered Golliath right? That’s about everything I wanted to cover for this. Hopefully this gives you that extra push to start pitching. It’s a lot less scary than I thought it was. It’s not even like you need to make cold calls so what’s really holding you back? If you want specific samples from me just leave a comment below, subscribe and I’ll shoot something over via e-mail! 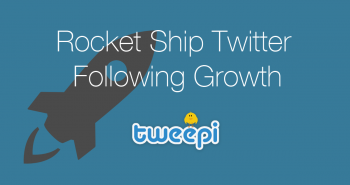 Did you know that Twitter Analytics is now available for everyone? 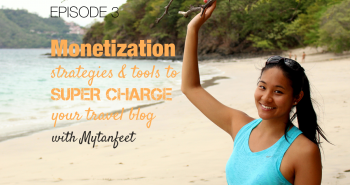 Learn from other travel bloggers by joining Facebook groups. Check out my fellow blogger Parm of Planet Blue Adventure talk about The Art of Pitching CVBs, Tourism Boards and PR firms. Hi Will, your recommendation is crystal clear and confirm the first feeling I had when I first discovered what PR and working with brands was. I’m sending my first media kit this week, you structure of introduction email will certainly help me getting started, thanks! Hey this post was so helpful! I am a Lifestyle Blogger and I recently started working with hotels. When I first started I was terrified to pitch to hotels because my blog mostly features fashion & beauty. But I was determined to branch out and create more travel content. To my surprise the first hotel I pitched to said yes, and I’ve done several more since. So I agree, it’s all about putting yourself out there! The right brand will say yes. Great stuff Will. I really appreciate these helpful posts on here. They way you break down things makes it easier to grasp. I just signed up for your newsletter too. Cheers! Much appreciated Wayne! Been following your blog for awhile too 🙂 Glad you’re making use of my posts so far! Is there anything else you’d like to see? This was very helpful Will. I realized I was not taking the right steps in my approach. I’m developing a startup that will require me to tour hotel rooms, but I need the Hotel’s consent and that hasn’t been successful. Would you be able to help me draft up a pitch for the Hotels (to my email address)Thanks! Hi Kim, if you want to reach out to me via e-mail feel free to shoot me more details. This is great advice, and I’m glad to finally see someone put up a pitch template, so a million thanks to both you and Mapping Megan! I definitely understand what you meant at the beginning, pitching seemed like such a big deal to me that I was too scared to even start. Thankfully I’m getting over that! 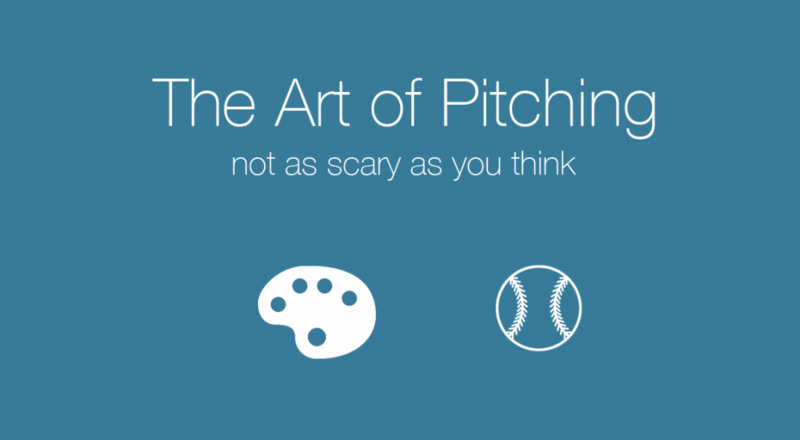 Regarding pitching and blog size – I have quite a recent blog (6 months) that is slowly but surely growing, yet still on the small side in terms of audience. However, I write for other sites and blogs (where I can write what I want without oversight, don’t need to request prior approval or anything) that have huge followings (100,000+ visitors per month). What’s the best way to work this into the pitch yet still bring up my blog & identity, because I think most hotels and tourist boards will respond to those sites’ numbers rather than mine. At that point am I even pitching as a blogger or a writer? Hey Joanna, happy to hear you’ve been able to make use of the pitch template. 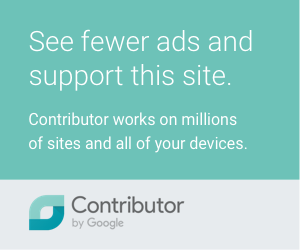 Regarding your blog size, I wouldn’t worry about it. Leverage the fact that you’re writing on other properties and make that more pronounced than your own stats. You want to word your pitch with an emphasis on your strengths and it’s the fact that you have so many connections with other sites/blogs. Question – did you ever pitch for a press trip with them paying you for content/campaigns on top of that? Any tips on approaching this please? I am running cottage accommodation business in Australia. For online exposure, we always try to communicate with travel related blogs. We have business interaction letter for different blog webmaster. To be honest, Your way of interaction pleased me . Appreciate the comments Ben! 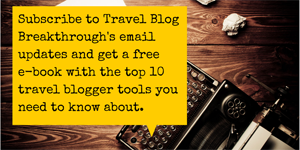 Curious, are there specific pitches from travel bloggers that have been very effective on you as a business? nice!.. this is so helpful for newbie blogger..
Hey Flora! Not a problem at all. This is definitely meant to be a great starting point. Make it your own and tweak it depending on who you’re pitching. Keep trying and you’re bound to get a positive response! I’m learning how to write a pitch letter for my ahead career path. It would be great if I could get email from you. Thank you for this article! 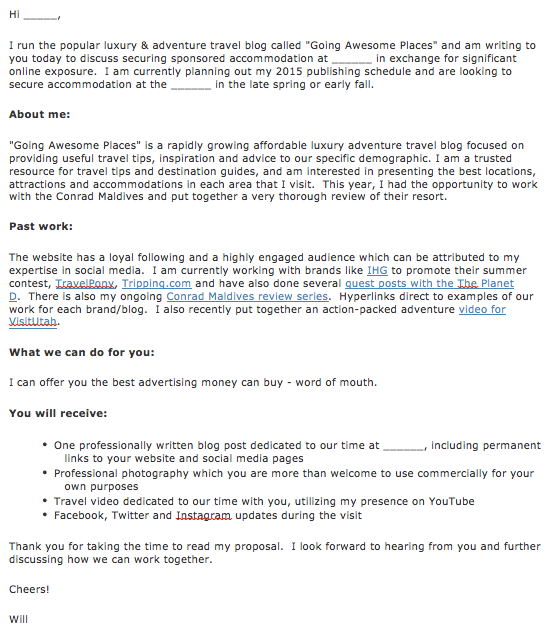 I just landed my first sponsored event as a travel blogger, and the way i did it was by just sending an email! It was so hard to send it because of my fear of being rejected, but I definitely agree with you – you just have to do it! I really love this article though because you have some great formatting tips on what the letter should include! Amazing Briana! How did your sponsored event go? Thanks for this Will! I’m going to be in Rajasthan in India in a couple of months and the Rajasthani tourist board seems really active so I’m thinking of biting the bullet and pitching to them… the thing is I would like to keep it pretty open ended to see what they would be willing to offer me (im keen for anything from free tours to hotel stays!) how would it be best to phrase this without seeming vague!? Hey Dulcie, I know this is a pretty late of me to be responding but definitely awesome that you’re thinking about pitching them (if you haven’t yet). If there isn’t a specific ask that you had in mind or don’t want to come across as too forward, you could just let them know that you’re coming down and would love to “work with them” and see how they respond. From there you could suggest areas that you need help in and what you plan on doing in terms of your blog content/social etc.